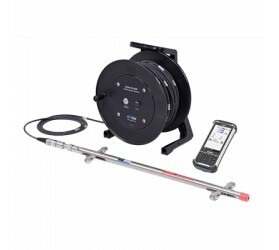 The Model GK-604D Digital Inclinometer System is delivered in its entirety and includes a Model 6100D Digital Inclinometer Probe, a reel-mounted cable and a Field PC. The Model 6100D contains electronics to convert the analog voltage into a digital signal, which is transmitted by the control cable to the cable reel containing the Interface, which communicates via Bluetooth® to the Model FPC-2 Field PC. A Digital Compass is built into the Inclinometer Probe to correct the inclinometer data sets for any twist (or spiraling) in the inclinometer casings. The spiral survey data is presented on (and stored in) the same FPC-2 Field PCused for taking inclinometer readings. An optional 12 volt electric cable reel system is available, which can provide substantial time savings when surveying deep inclinometer casings.